This week I have new music from Thrice, Foxing, The Spirit of the Beehive, mewithoutYou, and more. New Hopesfall Record is Coming!!! Hopesfall has returned!! The band has signed with Equal Vision and Graphic Nature Records. This January, the band will head into the studio with Mike Watts (Glassjaw, The Dear Hunter) to record their first new album in ten years. Guitarist Josh Brigham said “The motivation for making this new album comes from a genuine desire to remain creative by continuing to write and play music together again. We won’t lie, between having jobs, relationships, kids, and other responsibilities, it can be tough to make time to play, but as long as we feel like we still have something good to offer, we will find a balance.” The line-up will be Jay Forrest (vocals), Josh Brigham (guitar), Dustin Nadler (guitar), Chad Waldrup (bass) and Adam Morgan (drums). Equal Vision is also re-releasing the band’s final 3 record (The Satellite Years, A Types, and Magnetic North) on vinyl. You can pre-order those LP’s at http://equalvision.merchnow.com/catalogs/hopesfall. A Common Goal is a cool, old school, greaser punk band. The kind that always reminds you of Social Distortion. 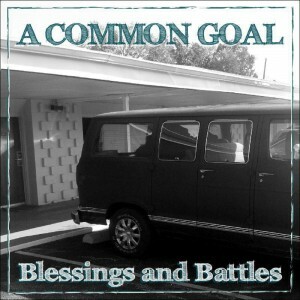 Blessing and Battles is a great easy listening record that carries a nice edge and intensity when needed. ACG is like a punch in the face when you hit play. It’s a great hard hitting song with a catchy hook. It’s about as crazy as A Common Goal gets. The rest of Blessing and Battles is a solid, easy to listen to record. Frame Of Mind is a fun song about the great times in life. Hope is a great song about how no matter what is going on in the world, there is still hope and goodness in Christ. The track starts off with news clips of terrible tragedies in the world. Musically there’s a great intro lead kick the song off and a catchy chorus to help get the message of hope across. Problems has a fantastic country western slide guitar that gives it an extra dimension and adds something more to A Common Goal’s sound. That’s followed by Nothing Left, which is the only real circle pit punk song on the record. Blessings and Battles is full of catchy choruses, songs of remembering the past and having hope for the future. The title of the album is a beautiful description of the lyrical content and just the nature of life. A Common Goal have done Boston proud with Blessings and Battles. A fun, laid back punk record. There are only a handful of bands as consistent as Eisley. With each release the band matures and grows. And with each release the band improves and adds to an impressive discography. The band’s fourth full-legnth is both something new for Eisley and more of what they’ve always given us. Currents is actually quite a departure from the band’s previous pop rock work. 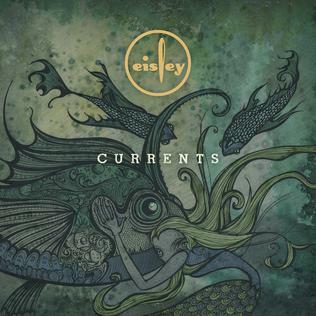 But the indie/shoegaze stylings on Currents is something that’s always been hinted at, just below the surface of some of Eisley’s best work. The title track on the band’s last ep, Deep Space, was just the beginning of what the band had in store. There’s an open disconnected feeling musically that starts Currents. The song takes it’s time to form, giving way to a sense of accomplishment and resolution when the full instrumentation kicks in. It’s still has the rock elements that The Valley had but its not nearly as lush. It’s a more complex arrangement than anything Eisley has delivered before. Blue Fish has a level of ambience that gives the song an added element to the Eisley’s beautiful melodies and harmonies. The Piano riff that runs through Drink The Water is absolutely gorgeous and reminds of why I love Ester Drang’s Infinite Keys so much. Save My Soul is a punchy rock song with a great hook. The string section that glides through Find Me Here is magnificently beautiful. Lost Enemies has a great quirky guitar riff and a cowbell giving the song a nice offbeat touch. Shelter closes out the record and is just another song to die for. Beautiful harmonies and huge sweeping strings. Eisley has taken a risk with Currents and it’s paid off in a huge way. Maybe not the follow-up to the Valley people were hoping for but every bit as good. Currents is a beautiful record. Eisley has outdone themselves again.